US, 2009, 140 minutes, Colour. Tom Hanks, Ewan Mc Gregor, Stellan Skarsgaard, Armin Mueller- Stahl. May to August in the northern hemisphere spring and summer is a time for almost weekly release of blockbusters with huge budgets, action and effects and potential for high grosses at the box office. 2009 has seen Wolverine, Star Trek, followed by Angels and Demons, with Night at the Museum 2, Transformers 2 and Terminator Salvation in the offing. Here is a doomsday plot, murder mystery, action thriller with a cast led by Tom Hanks as symbologist Robert Langdon and Ewan Mc Gregor as the Vatican Camerlengo and an international cast portraying scientists, police, bishops and cardinals. 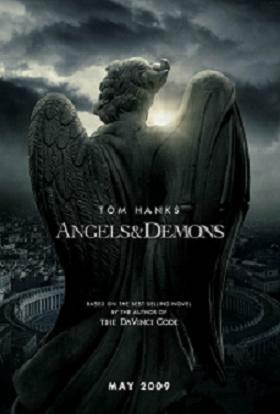 Angels and Demons, unlike the film of The Da Vinci Code, is fast-paced, the L' Osservatore Romano review referring to Ron Howard's dynamic direction. It also used the word 'commercial' as well as noting that it was 'harmless entertainment' and not a danger to the Church. In fact, the film treats the church quite interestingly, scenes behind a conclave and inside the conclave, fine sets of the Sistine Chapel, the interiors of St Peter's, Castel San Angelo, the Vatican Necropolis, the Swiss Guards centre, the Vatican archives and several churches with art by Bernini. The film won't harm tourism to Rome or to the Vatican. Probably, the contrary. One of the issues facing the conclave in the film is the Church in the Modern World vis-a-vis science, with the dialogue for the meeting of ideas of science and theology or extremist attitudes towards religion capitulating to science and so destroying the church – the point being that this kind of fanatic stance can become a cause, righteously crusading with violence against those who hold more moderate views – leading to what could be labelled 'ecclesiastical terrorism'. Oh, the tale has so many plot-holes (with the action moving so fast you don't quite have time to follow through on them) that they don't bear thinking about – so, either one sits irritated at the inaccuracies about dates and historical figures and driven up the wall by the lack of coherence in the course of events or, as one does, offer a willing suspension of disbelief and enjoy the action for what it is, a lavishly-mounted, pot-boiling thriller. 1.Audience expectations? The Da Vinci Code? Dan Brown and his ideas, theories, codes? Issues, science and religion, the church? 2.The adaptation of the novel, the prequel novel becoming a sequel film? 3.The location photography, the tourist eyes on Rome and the Vatican? Thriller eyes on Rome? The churches? The opening in Boston, CERN? The science and the equipment? Rome, the Vatican, exteriors and interiors? The musical score, religious, chorale, dramatic? 4.The credibility of the plot, the holes in the plot? Audiences willing to accept disbelief? The genre, the blockbuster action film? 5.The church context, the death of the pope, the cardinals assembling, the rituals, the breaking of the seal and the ring, the processions, the burial, the role of the Camerlengo? The authority of the Camerlengo? The Sistine Chapel, entering into the conclave, the cardinals, the range of nations, ordinary (and with their video cameras)? The places in the Sistine Chapel, the desks? Cardinal Strauss, the holding of the ballots, the ritual of reading them out, skewered, put in the fire for the smoke? Black smoke, white smoke? The crowds in St Peter’s, the acclaim? An authentic feel? 6.CERN and the visuals, the scientific background, the elaborate equipment, the plans, Vittoria and her role, the authorities, the cleric present, his caution? The experiment, its success, the formation of antimatter? The killer and his taking of the eye for identity, stealing the canister, Vittoria getting the cleric’s diaries? 7.The killer, hiding the canister under the Vatican? The midnight deadline? The role of the batteries, the contact, the explanations of the possible explosion? The pictures sent by computer? The warnings? Seeing the killer in action? His having abducted the cardinals, the preferiti, imprisoning them, the brands, earth, air, fire and water? Their deaths, the presence in Piazza Navone? The final rescue? His escape – and his car being wired for a bomb? 8.The background of the illuminati, the images, the code, the writing back and forth? How much based on history, speculation? Bernini and others associated? The Galileo case? Science and the church, the church hunting scientists, the scientists hunting the church? The elements, going to the centre? The signs, the statues, the pointers, the marble floors? Langdon deciphering this? 9.The Vatican calling him, the emissary going to Boston, his swimming, speculation, his experience with the Da Vinci Code, his wanting to get into the Vatican archives? His going? The chief of police and his scepticism? The Italian police, the head, the cooperation? The Swiss Guards, the young Swiss Guard attendant? The role of the camerlengo, the discussions with him, getting permission to go into the archives, the camerlengo questioning Langdon about faith? The documents, Vittoria and the translation, stealing the page? The car, the police officer? His being taken aback? The later visit to the archives, the oxygen situation, the smashing of the glass, the shelving, the shooting? The Galileo document? 10.Robert Langon, the past, his skills, being asked, meeting Vittoria at the Vatican, his reactions to the situation? The police chief and his grudging cooperation? The Italian, collaboration, the pathos of his death and the various police killed in the church? The camerlengo, collaboration? The timetable for the deaths of the cardinals? Tracking down the churches, going to the Pantheon, looking for Raffaele’s tomb, the transfer, the tomb, going to Piazza del Popolo, the church under repair, the tomb, too late for the cardinal? The search for Bernini and the St Teresa statue, the fire? St Peter’s Square? The winds blowing? The dead cardinal? The fire in the church, the killer present? The death of the police? The discerning of Piazza Navone, the killer present with his van, killing the police, escaping? Castel Sant' Angelo, the prison, the remains of the cardinal’s clothes, the branding irons? The discovery of the place of the bomb, St Peter’s tomb, the necropolis? The confrontation between the chief of police and the camerlengo, the bishop, their deaths? Going down, finding the killer, his not killing them, not part of his contract? Finding the canister, the camerlengo taking it, going in the helicopter, going higher? 11.The camerlengo and his authority, the background story, Ireland, the pope taking him up, his military service, a pilot? Helping, his attitude towards the conclave, his views, the clashes with Cardinal Strauss? His branding himself, taking the helicopter, its explosion and the repercussions for the people in St Peter’s? His landing with the parachute? Acclaim? The diaries, the discovery of the video? His escape from the cardinals, going into St Peter’s, going downstairs, immolating himself? 12.Robert Langdon’s character, his contribution to the Da Vinci Code, the Vatican having faith in him, his own beliefs, the Galileo document for his work? His using his wits, pursuing the case, the dangers, the killer in action, in the archives, in the churches? The finale and the finding of the canister? The discussions with Vittoria about science, Latin, religion? 13.Cardinal Strauss, aged, his decisions, abiding by the Vatican rules, clashes with the camerlengo, going ahead with the conclave despite the risk? The plan for the evacuation, his refusal? His becoming eligible to be elected? The issue of the acclaim for the camerlengo after his heroism? The discovery of the truth? The variety of cardinals, international? The bishop attendant on Cardinal Strauss and his being shot? 14.Science, religion, in the modern world? Dialogue, tradition, science as a threat? The attitude of the camerlengo, his long speeches of explanation? His becoming fanatical – an ecclesiastical terrorist? 15.The pace, action, the mystery, clues, success as a thriller? The amount of expository dialogue to explain the background? And the audience suspending disbelief and enjoying it? Just what everyone has been waiting for: a film of a Dan Brown novel! However, with the report of a review in L'Osservatore Romano after the film's premiere in Rome saying that the film was commercial and entertaining and that Ron Howard had made an effective thriller (although the review also suggested a mind game while watching the film, to pick the inaccuracies! ), it means that a lot of the heat should have gone out of any controversy. SIGNIS Cinema Desk would certainly endorse the reviewer's conclusion that the film is 'two hours of harmless entertainment' and not a danger to the church. Had there been no Da Vinci Code novel, film or controversy, then Angels and Demons would have probably been reviewed as a blockbuster doomsday, murder mystery thriller with a Vatican setting (looking rather authentic), discussions about the church and science with the Catholic Church treated quite respectfully. (References to persecution of scientists in the 16th and 17th centuries was sometimes inquisitorial – and is documented; prison was not easy for Galileo.) There are speculations about the secret society of scientists, The Illuminati, who seem to be a Masonic equivalent. Angels and Demons was written some years before The Da Vinci Code and is a better written book though it is an 'airport novel', a page-turner. As with many historical novels (and Shakespeare himself was not above creating 'historical' scenarios that were inventive rather than factual), the author takes imaginative license with characters, events, and hypotheses: what if...? But Angels and Demons has a character who seems to do a 180 degree turn in character and behaviour which makes the psychological realism of the book rather absurd. In the film, there is less depth of explaining this character and so the revelation tends to be a cinema twist which, however preposterous, is somewhat more credible, at least in terms of the far-fetched plot itself. While Ron Howard did not have permissions to film in the Vatican, the sets of the Sistine Chapel, St Peter's interiors, the Vatican Archives look quite convincing and were commented on favourably by the L'Osservatore Romano reviewer. The scenes of the CERNS reactor are very impressive. The key point about Angels and Demons is its church subject: church and science, past conflicts, the present challenge, a feature of recent Vatican discussions about evolution and creationism, the meeting of science and religion rather than antagonism. Not a difficult subject when one thinks of Galileo and Pope John Paul's apology in 2000. Which means that the central issues are not as threatening or offensive as the hypothesis of The Da Vinci Code with its relationship between Jesus and Mary Magdalene and their descendants. The day before the preview of Angels and Demons in London, channel 5 screened The Body which came and went several years ago without too much angst or even discussion. Antonio Banderas portrayed a Jesuit from Rome going to Jerusalem to examine bones discovered in what might have been Jesus' tomb and which would threaten a traditional understanding of the resurrection. There are plenty of novels and films which raise such issues by way of interest and entertainment but are not put forward as theology. The controversy about The Da Vinci Code, book and film, certainly got people going all around the world, given the number of books sold and the multi-millions of readers. The Opus Dei connection also contributed to some of the furore. However, this time, with only science and the church (and issues of anti-matter and its potential for mass destruction in the wrong hands) and the Vatican itself calling in Robert Langdon (Tom Hanks) to solve the problems, the potential for argument is limited. As with the screenplay for The Da Vinci Code, lines have been inserted more favourable to the church. Langdon reminds the Vatican that, despite the previous controversy, they have called him in this time. There are respectful lines concerning faith and non-belief – and a final request to Langdon from Cardinal Strauss that he write gently about the church! One of the issues facing the conclave in the film is the 'Church in the Modern World' vis-a-vis science, with the dialogue for the meeting of ideas of science and theology or extremist attitudes towards religion capitulating to science and so destroying the church – the point being that this kind of fanatic stance can become a cause, righteously crusading with violence against those who hold more moderate views – leading to what could be labelled 'ecclesiastical terrorism'. A key issue prior to the release of the film has been the raising of controversy about the film, sight unseen, a protest that undermines the protesters' credibility. Any controversy and protest about a film is a challenge for the church to look at how it responds. The Vatican comments from Fr Federico Lombardi deflected some heat with offhand humour (that he would say something if the film-makers took out 1000 10 year subscriptions to L'Osservatore!). However, several Italian papers began making comments about Vatican officials possibly criticising the film some months earlier. This made headlines in the media that the Vatican would object or was objecting. And publicists must have been offering prayers of thanksgiving that these rumours were doing some of their job for them. But, in the Catholic world, the main protest has come from William Donohue, president of the Catholic League in the United States. As he did with The Da Vinci Code and The Golden Compass, he issued lists of errors in the book and said that they were to insult the church. It was alleged that he had a Canadian priest contact, not wearing clerical dress, on the set of Angels and Demons who reported that director Ron Howard and members of the production were verbally anti-Catholic. On the basis of this, spurred by an Indian journalist who is linked with the Catholic League, processions of protest were held in India and Taiwan. Many of the errors and alleged insults to the church in the Catholic League list are not in the film. This kind of thing (which may not go much further because of the L' Osservatore favourable comments) indicates that there is a profound difference in responding to a film, or anything that is challenging, from an 'education' point of view which leads to dialogue rather than a 'crusading' point of view which leads to two-sided polemic with antagonists rather enjoying the experience of battle in crusade. Dialogue can lead somewhere. Polemic leads nowhere but simply confirms antagonists in their positions and stances and introduces the hurling of invective which in no way mirrors the charity and peace of Christ.